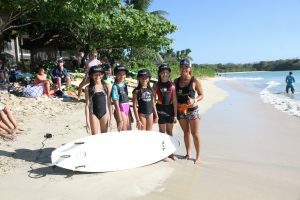 The Fiji Girls Surf Clinic is an annual event held by Fiji Surf Co. and Fiji Surfing Association along with this year’s sponsor Bulalicious Activewear. It is a special event for me because amongst my own surf training, contests, travel and work, I really look forward to spending a day with the young ladies from around my nation. Each year we get girls who travel all the way from Lautoka and Suva to attend this surf day at Natadola beach. This year I was so stoked to pull up to the beach and find a group of 10 girls already out practicing their surfing and seeing their parents getting involved. The activities I had planned for the clinic included three different groups assorted by age, one station being Surf lessons, the other was yoga and stretching, finally the third group was a paddle board relay. Once each group had rotated through every station there was a final free surf for everyone before handing out awards on the beach. What made this year extra special was the inclusion of Bulalicious Activewear who donated personal certificates for five different categories throughout the surf session. I was so happy to announce these winners who will be a part of the next Bulalicious photoshoot plus they also win a full Bulalicious outfit! It is so rewarding to see how much stoke these young ladies have and I can’t wait to do something like this again. With that said, I will be holding regular girl surf days in my region for all the little ones who want to continue surfing regularly….so stay tuned. This clinic has given us all a boost of inspiration and acknowledgement for the need to invest in our younger generations. I am so hopeful for what’s in store for these young girls especially after what I witnessed at the clinic last weekend with all the natural talent and athleticism.